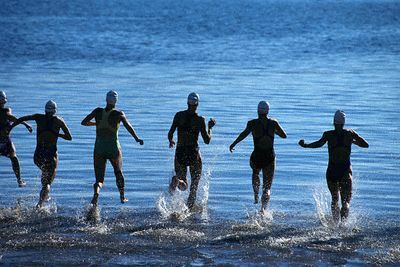 This is a directory of topics addressing various apsects of running and swimming that are taught in Breakwater Sports programs. Swimming requires complex, whole-body movements that are not natural for vertical, land based creatures. You will never completely master all of the skills involved. You will need to keep going back to the fundamentals, and work your way through various progressions on the road to mastery. Running is different - humans are born to run. But running with good form does not come naturally for people who have matured in modern culture. Mastering Posture How to organize and hold your body in the most efficient form for freestyle and backstroke. You want to be a torpedo. Not a banana. Not a limp piece of pasta. Mastering Balance How to train your body to maintain balance around your spine. You want to move your torpedo (see Posture, above) in a straight line parallel to the surface. Stop swimming uphill. Stop wobbling. Breathing Without constant attention, your breathing will disrupt every other aspect of your stroke. You have to make your breathing as seamless as possible. See the first video on the Breathing video clips page. Head position affects posture, balance, breathing and shoulder mobility - in short, just about everything about the stroke. For endurance swimming, the kick doesn't provide much propulsion. But that doesn't mean it's not important. Sloppy kicking (or no kicking at all) will you down - so you need to work on keeping your kick compact, and keeping it out of the way. Learn to kick correctly first on dry land - see Dry Kicking for Freestyle and Backstroke. Also See the great kicking article on the Swim Smooth Website: Leg kick in the freestyle stroke. For lots of drills and tips, see Video Clips - Kicking. We are very hand centered, so we want to think about our arms first. And you can start working on hand and arm movements early in the process. But, what you do with your arms doesn't matter much unless you are on the road to mastery with your posture, balance, breathing, and kicking. So pay more attention to all of those things first! Then, learn to do a proper setup - see Arm Stroke Setup, followed by the catch and pull - see Catch & Pull. (not yet...) Just keep in mind, "It don't mean a thing, if it ain't got that swing." Backstroke Basics Learn backstroke, and your freestyle stroke will improve. Guaranteed. Great Form What does good running form look like? Check out these clips. Correcting Low Cadence Optimal cadence varies a bit, but there are few successful distance runners who run with a cadence of less than 180 (foot strikes per minute). Correcting Toe Out Does your big toe point away from your centerline while running or walking? Correct this problem by leveling your pelvis (not by trying to change your foot position when landing). Here are some running technique websites that you might browse. I have worked with some of these coaches in the past at USA Triathlon and Total Immersion Triathlon clinics.